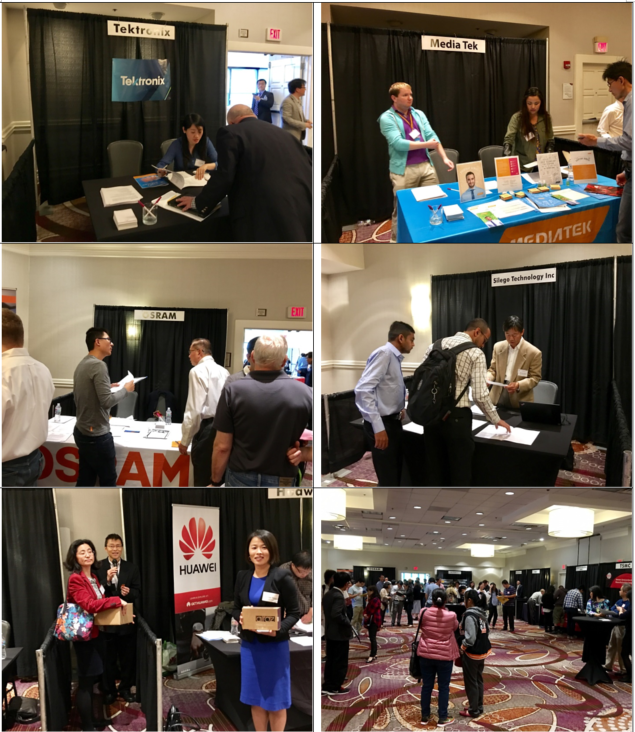 CASPA 2017 High Tech Job Fair was successfully held on Saturday, May 13, 2017 from 10 am till 4 pm at Crowne Plaza San Jose-Silicon Valley, CA. 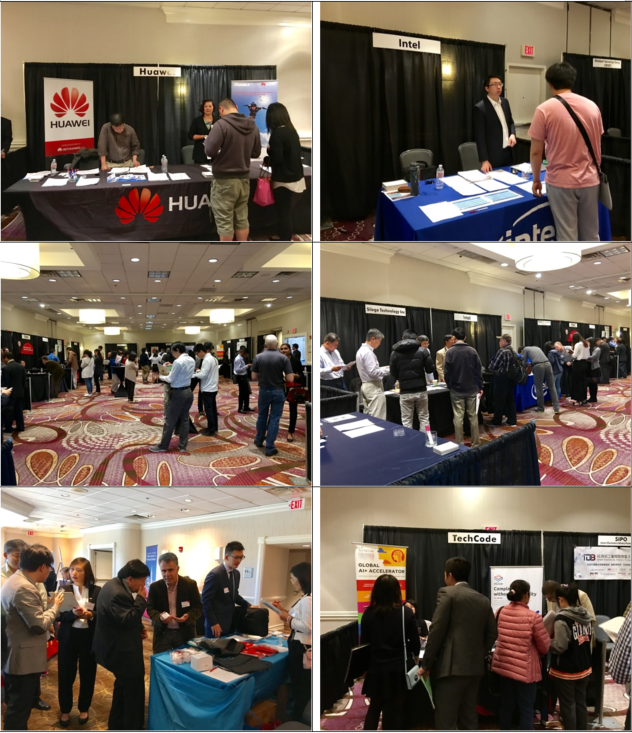 18 companies attended this year’s job fair, including Intel, Huawei, TSMC, Tektronix, MediaTek, OSRAM, Fujian Jinhua Integrated Circuit, SMIC, Kilopass Technology, YMTC/XMC, Focal Tech, Tech Code, Silego Technology, SIPO, GUC, Hefei Semiconductor Industry Park and King Semi. Many of them are also CASPA sponsors. These companies have numerous opening positions at various levels, from Vice president/CTO, technical and marketing/sales managers/directors, system architects, circuit designers, FAEs, layout engineers, process engineers, web developers and more. This job fair offers an excellent face-face communication opportunity for the job seeks and hiring companies. 9 companies are invited to give a brief introduction about their company and answered questions from the audience. Some companies have the hiring managers come to the job fair. If the right applicants were found, they could interviewed by the hiring managers at a separate room. Many applicants also take advantage of the on-site opportunities to meet with the hiring managers directly. A few companies filled some critical positions on-site. More than 600 job seekers attended the job fair. To help the job seekers with their job hunting and career planning, three career coaching seminars were offered by three senior career coaches. The topics of the seminars are: “How to do the right career change”, “Using Personality Science to Understand Why They Hire” and “7 Habits of Highly Effective Job Seekers”. In addition, a free resume-critique service was offered by an experienced career coach to help the job seekers for polish their resume. A job seeker could get advices about his/her resume from an experienced career coach. Junzhao Lei, the 2017 Chairman & President of CASPA, was the Chair of this year’s Job Fair; Song Xue, Brand Wang, Danny Hua and Connie Miao helped all the presentations and seminars. Xiaodong Zhang and Jessica Tseng were the Facility managers, Albert Yian in charge of press release. Yang Zhang was editor-in-chief of the proceedings, John Lu and Jin Wang organized the team for registration. William Kou was the MC for the Job Fair Exhibition Hall program for the day. A lot of other CASPA board members and volunteers also helped throughout the event for different functions. CASPA is proud to organize its 2017 Job Fair as it delivered valuable results to the communities, including the hiring companies and job seekers. This job fair helped corporate sponsors acquire talents to join their work force to grow their businesses. It also offers job seekers a great opportunity to find rewarding jobs and get career advices from career coaches. CASPA would thank its corporate sponsors, all 18 participating companies, and all the attendees for their great support. It would also like to greatly thank each and every member of its 2017 Job Fair Organization Team and all the Board members, volunteers of CASPA for their hard work and dedication.